Pool and Spa are OPEN! The Great OutRoars area is a welcoming outdoor facility that includes a 3-lap lane heated leisure pool, a two-tier spa, two sand volleyball courts, two basketball courts, picnic tables, and a sunbathing area. 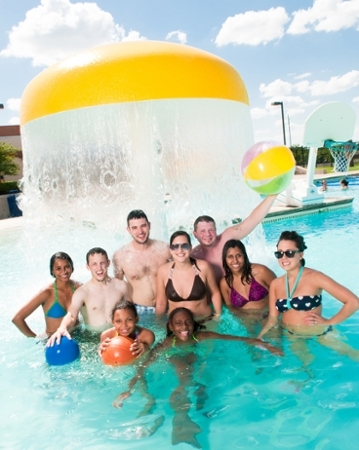 The Aquatics program continually offers a variety of programs and activities so the members of the A&M-Commerce community can maintain a healthy lifestyle, stay fit, and have fun while enjoying the outdoors. Please view the swim attire guidelines before you arrive. Reservations: Please check out the reservations page for information about reserving. *Please note the pool and outdoor area are subject to close unexpectedly due to unforeseen circumstances and inclement weather.